Jack Butala: Hire Only Experts. Every Single month we give away a property for free. It’s super simple to qualify. Two simple steps. Leave us your feedback for this podcast on iTunes and number two, get the free ebook at landacademy.com, you don’t even have to read it. Thanks for listening. Jack Butala from Land Academy. Welcome to our Cash Flow From Land show. 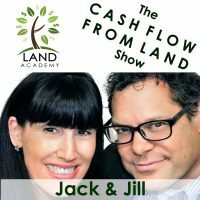 In this episode, Jill and I talk about why you should only hire experts to help you succeed in the land business and probably really anything else for that matter. I think I’m including us in that. I know I am. Great show today. As always, we’re going to tell it just like we see it, call it like we see it. Before we get right to the topic, let’s take a question from a caller. Okay. Barry from Portland called in and asked, “I know I want to be in this business, and I’m thinking about my first property. Should I try on my own first? With a mentor? When will I know I’m ready?” Steven, you wanna weigh in first? Yeah, my short answer is yes, yes and yes. Jill and I have had the great fortune of having a ton of members by now. I mean company’s, the Land Academy company is only a year old, Jill? … for a lot of people, and a lot of our members. Jill, go ahead. You always have a pretty consistent answer with this. Go ahead. Well, how would you answer it? I kinda answered it. Should I try on my own? Yes. With a mentor? Preferably. Gosh, when will you know you’re ready? You won’t. That’s what I say. You don’t know you’re ready. You just have to dive in. It’s like jumping off the deep end. You’re going to jump in, you’re going to be fine, you’re going to swim, you’re going to be okay, but you have got to just do it. Yes, you’re going to be clunky at first, you might make a few mistakes at first. You have to just do it, man. You might over pay for a mailer or something stupid, you know what I mean. Not with us you won’t. You know what I mean. But you learn. You will figure it out. Buy a property. If you are concerned about this, Barry from Portland. Buy a property, somewhere that you can find one, it doesn’t have to be from us or anywhere. Go on land watch, find the cheapest property you can find, I don’t know a couple hundred bucks, buy it. Deed it to your wife, have it deeded to yourself so you get all of that out of your system. In my opinion it is very easier to deed a property to someone than it is to register your car. Re-post it on land watch. Whatever your talents are, re-post it on land watch or anywhere else that you can find on the internet, Zilla, Trulia, for twice as much. If you are paying two or three or four hundred bucks, list it for 8 or 9 hundred, and take the best offer. Go through the whole process without the intention of making a ton of money but just to get it out of your system and just get past it. That’s my answer for that. That is exactly what I say too. Same thing. Then I tell people the same thing, it is funny because you can find things under $500. You’re not worrying about it, you only spent $500, kind of thing. If it takes weeks while you figure this out and then just sell, who cares. You’re not spending $10,000 or $80,000. I think that is where people, I don’t know, they get hung up. They are going for some things that maybe they shouldn’t be going for yet. I agree with you Steven. Somebody asked me this question a long time ago and it stuck with me obviously. This is what she said, she kept saying it over and over again, “How do you know, Steve? How do you know?” And I said how do I know what. “How do you know what you’re doing is going to work or that it works? How do you know?” What she was really asking me after she said it four times, or fourteen or something like that, it was enough for me to remember it over the years, what she was asking me was how do I pick the right property so that I know, you know, so that I know we are going to make at least double our money on it or maybe more, when I sell it. Here is the answer, I go and research what the stuff is worth based on comparable sales at the time. Either comparable sales or existing postings or I don’t know. You just do a bunch of research, it is pretty simple. If you are looking at a couple of acres in Northern Arizona, and everything up there is selling for 3, 4, 5 thousand bucks, you want to be able to make sure you are buying it for 5 or 6 hundred dollars from somebody that doesn’t want it any longer. There is no mystery in it. You know what it is I think Jill? I never went through this. I saw a property, I talk about this is the free ebook at landacademy.com. I bought a property on my coffee table from back east in Arizona. I did it in all of 30 minutes on ebay. That was the first deal I ever did, first land deal I ever did. I doubled or tripled my money. I didn’t have any trepidation when I was doing it. I don’t think you did either, the first deal that you did, I don’t even think you thought twice about it. That is usually me. I close my eyes and jump on things like this often. Sometimes I get myself into a pickle because I do not do enough research ahead of time. Not this kind of thing, I’m talking other … Boy, I am just throwing myself under the bus aren’t I.
I took exactly one golf lesson in my whole life. I am not a golfer at all. I cannot stand to fail at something for ten hours or whatever. The coach said, the trainer, the golf pro said, “You just kind of swing hard and hope for the best?” I turned around and looked at her and said that is exactly how I approach a lot of stuff in life. He started laughing but that is the truth. Some people have this analysis paralysis thing. I hear about it all of the time. That phrase is getting way over used. I have another idea, well I have two things to say, one is, to give a really good working example of me goofing myself up is, Steven has been known to take me on ski runs that are way too difficult than I can do. The last seven days I was thrown into ski situations that are way beyond my talent level. I am not a skier, I am just going to say it right now. I am a good beginning and I do not strive to get anywhere beyond that, I am over it. I can do other things man, I can snow mobile like 90 miles an hour, watch out, put me on something like that. That is what I was kind of referring to. Thank you. That’s what I said, my favorite part of the skiing is kind of dressing up for it. They have really cute outfits. Anyway. My suggestion, I have one suggestion for Barry, get yourself a partner who is not afraid and together you guys can help each other. If you have someone who is not afraid and eager to go they will be able to say enough research, we are buying it. That is another good idea, way to do it. A mentor will help you with that too. Or a community. Successplant.com is a site that Jill and I started for exactly to address these types of questions. It’s free. If you go there and get a user name, you can go out there and ask any questions that you want. Most of our existing, or some of our existing members I should say, are in there, answering questions and asking questions. Some have a thousand deals under their belt and some have not done any. It is a free resource, basically. It is for everybody. A lot of our people but everybody can get in and just ask them questions, ask away. It is really just kind of tailored to what we do. Our niche. We have all kinds of other things in there. It is fun for us to watch because a lot of people just like Barry have some trepidation in the beginning. It’s not trepidation, it’s just jitters, that’s what I call it. Then they do one or two deals, then Jill and I don’t hear from them. We don’t hear from them for like four months, they do 25 deals, and then they come back and start to say you know what, this actually works. I am into it now. I have worked it all out. You guys were right, I made a bunch of mistakes. I am over it. Now let’s get it into third gear. I love that. That is the best feeling I can get as a helper, I don’t know what to call us anymore. We’re not mentors really. I don’t know what we are. I know what we are. Hey, did you see what Luke put in the other day? Unless I read this wrong but I don’t think I did, I want to say Luke says he is right now averaging one sale a day. You know what he put it in, not in success plant, but it was another … Was it in success plant? He is one of our people. He put an apple on our desk, he is that kind of member. Man, this guy is just killing it. He came to us with a little bit of experience already but jeez. You did not read that. Yeah, I read that. I’m like nice job Luke. Back to the topic if that is okay. How to find experts. Yeah, that is a better question. That is what we should have called it. How do you find an expert. You should hire only experts. Let’s cover that too, quickly. You need to get it out there. Put it out there that you are looking for it. Hopefully by word of mouth … Usually that is a lot of the way we find people too for our stuff. Word of mouth. Our office building is being completely renovated right now. Every time I walk where it is being … The common area is, not our offices but the common areas. Every time I walk through there I see the tradesmen, foremen, or general contractors supervisors … You can tell exactly who is into what they are doing and who just doesn’t want to be there. That is an expert in my opinion. It is not an expert like big picture expert, it is somebody who is laying tile but they are showing up for the job. You can clearly see that they are an expert and they are completely into what they are doing, they have no idea what’s going on in their surroundings, and I love that. I thought you just said it was a positive thing. I was ready for you to say he is killing it, he’s just whipping or clacking that whip. It is a virtual assistant though. … who are fantastic at what they do, yeah. I mean people understand that term now more than an outsourced employee. Isn’t that kind of funny. It used to be you had to explain what a VA was. Now everybody knows what a VA was. If you say something else they go, what? Sounds like you’re doing it from India. That is what it sounds like to me too, which is not a bad thing at all. I’m just saying. The way that we use VA’s and outsource is very task specific. When I hear virtual assistant it’s like, I don’t have an assistant in my office anymore, I have one that is virtual and they do all stuff, but they just don’t. It is all very task specific because they are good at those things. Hire an expert who is really specifically good at one thing, and manage a lot of them. If they are good you don’t have to manage them at all. I looked at the numbers before we did this show. We hire maybe 4-6 people before we actually end up with the one that is going to work for us. Then we eventually use them because somebody gets a hold of them and says you are great at this, I am going to pay just a pile of money to do it for me full time. It’s like a baby sitter, you know, they grow up. That’s what I was thinking too. I wrote three notes about how to find and research at word of mouth. My number three and last item for this whole call was pray they don’t retire or move. Because that happens. You find a good handyman and then they are gone or they retire or something. It’s like, shucks. It is nice when you find them. That is the goal. Is to do everything like we talked about. Whatever it is. Keep them in your world. Use them. Be good to them, I guess. Pray they don’t go away. … is Fiver. It’s not … Fiver, the name is a little bit misleading. You may spend five dollars to get somebody to do a task, but what you are really doing is spending five dollars to see if they can do some stuff properly, and then you hire them to do things more consistently and for more money if they do a good job. The five dollars is just an entry level deal. I’ve hired some really poorly performing people on Fiver and I have found some total gems. You just have to play that game. Hire an expert. Don’t settle for anything less. This is a topic where nice guys finish last. You really just have to cut them off if they don’t work well. True. I was going to say to that a VA is not Siri. Just so you know. That does not count. When you find, like Steven said, when you find them keep them. Treat them good. Treat them well. Treat them good. Keep them with you. There are a lot of flippers out there. I know they have really good contractors and I think they are almost afraid to share them because they don’t want them to get too busy. That’s what we do. We have our go to guys. We have a team and we have been using them now for years. They do our personal projects and stuff that we flip. It’s awesome. I made a little short list of the experts that I have experienced in the past. Ones that I have had great experiences with and a short list of experiences I have had that are awful. I am going to share them and then you do the same thing. To this day, I have never been able to find a property manager that really works long term. Why is that? … it’s possibly considered an entry level position. I don’t want to tick off any property managers that have been in it long term, but I wonder if people look at that as a stepping stone. Just a way to get a paycheck coming in while they are learning the business. That is one reason I have. It’s a strange in the middle position to be in. You’re not an investor, you’re not an agent. It’s kind of almost a too comfortable … This is what I think, you’re not motivated by money. Once you sign the contract to manage a building or a house or whatever it ends of being, you are just kind of there, and not motivated by anything to really do a good job. Mm-hmm (affirmative). Unless it’s your business and you’re building up your clientele. If that’s the case, and this is what I have seen with property managers, that’s a great point, what they are really good at is getting property management contracts. They’re not good at actually managing it. Anyway. It’s in the middle. I have had great real estate agents, I do have a great real estate agent right now, and I have had a slew of pretty awful ones. I have seen a lot of awful ones, they just aren’t committed. That’s what I see. I see a lot of agents that are interested in curtains, curtain rods, and window treatments and not interested in the economics of a deal. What else. I see, I mean I have example after example of great real estate investors, on all types of property. For some reason, it’s a really unique set of skills. I also have a huge, well a pretty large number of friends and colleagues who are extremely successful at what they do who would not touch real estate as an investment. They think it is too slow. It doesn’t make enough money. You have to have some patience. People that flip broker companies and stuff. I don’t know where this path is going. I don’t know where you are going with this either. I know you’re falling asleep over there. Join us in another episode where Jill and I discuss your all important success in property investment and in life. It made sense to me. Okay, I’m glad. As long as in your head that you got this. I am sure there is three people out there that followed right along and we just cut them off. Just kidding. No, that was really good though. I appreciate that. It is important for people to take the time, do your homework. Just because somebody says, here’s a good point, wish I would have brought it up earlier, just because somebody says they’re an expert and they put it on their website or whatever it is, doesn’t mean they are. Please check their track record. Please make sure. How many transactions have they done. I’m an expert, I’ve done three. Really. I am going to tell a story really quick and I am not going to name any names. Jill, you’re going to laugh. Jill and I get invited constantly to be guests on peoples podcasts. There is this guy that has, for whatever reason, has a reasonably successful real estate based podcast. He has surrounded himself with a lot of people that schedule guests for him. They schedule us because it is a logical … There are professional schedulers out there that go an schedule like kind people to be on each other’s shows. Jill, if you’re a consistent listener, you would know we don’t have a ton of guests on our show but we get invited a lot and we are on other people’s shows quite often. This host and us, for whatever reason, it trips the radar on these schedulers. We have been scheduled on this guys shows many times. I don’t think he looks to see that we are scheduled. The last time, which is the most recent time, many times we have been scheduled on the show, we are all sitting in front of the microphones waiting, and he cancels literally the last minute. I am not going to name any names. I called him on it this last time, sent a pretty scathing email and said we are taking you off our list man. This is ridiculous. At best, it’s unprofessional. I really think what’s going on is he finds out who he is going to talk to, exactly what you just said Jill, where you have all of this experience and a very successful podcast and he’s like I cannot even hold a candle to these guys. I bet it’s zero with this guy. Oh, that’s true too. Because people talk about it and they have people on it, but they don’t necessarily do it. It’s just a topic that they like. Got it. I agree. On that note, let’s go buy some investment property.